This article is about a former australian cricketer darren lehamann who is known for his allround game. A very good middle order batsman and a handy slow bowler. Here is given the information about the profile, cricket career and records of this player. Darren Lehmann is a former Australian cricketer who established himself as a batting all-rounder. An aggressive batsman at the middle order of the Australian batting line up, he is also an useful slow blower. He is also one of the most experienced player in australian domestic cricket with a brilliant record. Lehmann started playing First Class Cricket in 1987 for South Australia. In a match against Victoria in 1989, he played an innings of 228 runs. In 1990, he starts playing for Victoria. He also played in County Cricket for Yorkshire from 1997 to 2006. His record in County cricket is very impressive. His best score is 339 runs in a match against Durham in 2006. He captained the Yorkshire Team in 2002. He also has captained the South Australia in Australian domestic cricket after rejoining the team in 1994. 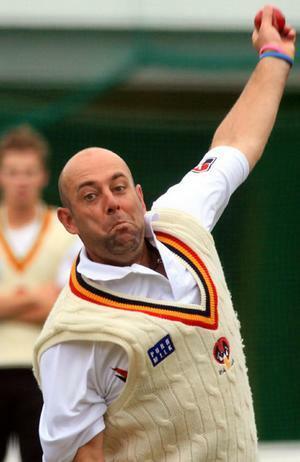 Darren Lehmann played his first International game in 1996 against Sri Lanka in an ODI Match. His Test debut came against India in 1998 at Bangalore. He made a very good 52 runs in his debut test. He was in and out of the Australian test team for a long period but in ODI Team he become a regular member of the team. He also played in 1999 Cricket World Cup and 2003 Cricket World Cup. Shane Watson is the No 1 all rounder in ODI cricket of ICC rankings. This article gives you complete information about Shane Watson. Biography and profile of Shane Watson is given in this article. Career performance of Watson is also quoted in this article. This article gives you all information about Matthew Hayden, one of the best cricket player in the world.You want to know more about Matthew Hayden Cricket career, biography, record and profile then read the full article. This article gives you complete information about Adam Gilchrist, best wicket keeper in world cricket. This article gives you details about biography and profile of Adam Gilchrist. More details about career performance of Gilchrist is also quoted in this article. This article gives you all information about Ricky Ponting, one of the best cricket player in the world and.You want to know more about Australian former captain Ricky Ponting cricket career, biography, record and profile then read the full article. This article give you complete information about Shane Warne who is the best and retired leg spinner of Australian cricket team. This article gives details about biography, profile and career performance of Shane Warne in International cricket. Read the article till the end for more information about Shane Warne.